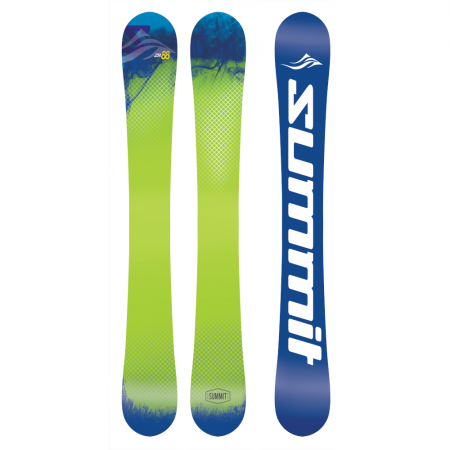 The Summit ZR 88 cm Skiboards RD are truly one of the funnest skiboards made by Summit Skiboards. With the ZR 88’s, Summit continues to take the sport of skiboarding to a whole new level of performance. 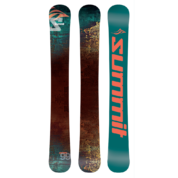 The Summit ZR 88 cm Twin Tip Skiboards 2019 feature a parabolic sidecut is constructed to function impeccably with the solid birch wood core to deliver almost effortless carves. These hold an edge no matter how hard you charge it, even on ice. Now you can truly rip the moguls, fly through the glades making faster turns than you can believe and still hold a solid edge when flying down the groomed runs. Symmetrical twin tips allow ease of riding forwards and backwards and are great for playing in the parks and pipes or even moguls. One special feature that will definitely get you noticed is the flourescent glow bases that actually reflect off the snow! Recommended for: beginners, intermediate and even advanced riders – all levels can truly enjoy the fun that these provide. Skaters will especially feel immediately at home on these and these truly feel like skating on snow. Tuning: Edges come fully sharpened. We include a free hand how wax. For future tuning, we highly recommend the Quick Mini Tune Kit. The Atomic L10 bindings come with free mounting and free wide brake. The L10 features an excellent range of release values and is easy to operate. Adjusting the front clamp and heel can be done by hand without tools. These bindings feature: DIN range of 3-10. Twin pivot. Toe height adjustment. Adjustments can be done by hand and fits ski boot sizes 261-384 mm (approx. size 4 – 14 U.S.). Height: 30mm. Atomic L7 bindings for smaller boot sizes – 2-11 US. Technine Custom Pro DS Snowboard Bindings: These were designed by us to work perfectly with skiboards, while allowing you the comfort of using snowboard boots on your skiboards. For 4 years running now, these have a proven track record of skiboard performance with snowboard boots. The Custom Snowboard bindings feature 3 padded rachet straps to hold you in place when carving. This allows a more stable interface between boots and bindings. Includes two Quick Leashes and Summit Snowboard Binding Riser Kit. Fits snowboard boot sizes 7-14 US. Non-release skiboard bindings and regular snowboard bindings (you’ll need the Snowboard Binding Adaptor Kit): both fit into the standard 40 X 40mm insert mounting pattern.